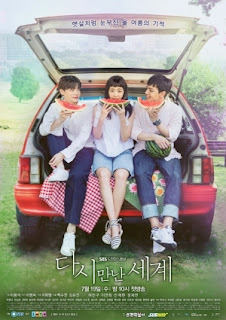 Reunited Worlds (Hangul: 다시 만난 세계; RR: Dashi Mannan Segye) is a South Korean television series starring Yeo Jin-goo and Lee Yeon-hee. It aires on SBS every Wednesday and Thursday at 22:00 (KST) starting July 19, 2017. Plot: Hae-Sung (Yeo Jin-Goo) is a senior high school student. He lives with his grandmother and 4 younger siblings. As the eldest brother, he has a strong sense of responsibility. Although Hae-Sung has good scores at school, he opts to go to a culinary school to support his family rather than college. At the culinary school, he hangs out with 5 friends including Jung-Won (Lee Yeon-Hee). Jung-Won is almost like his girlfriend. On Hae-Sung birthday, Jung-Won prepares a surprise party for him at his house. To keep him away from the house while they prepare, Jung-Won asks Hae-Sung to go to their school and retrieve her wallet. There, Hae-Sung walks into a shocking scene. While trying to get help, Hae-Sung is hit by a car and dies. Exactly 12 years after Hae-Sung's death, Hae-Sung wakes up on the roof of his school building. He finds himself in the year 2017. Hae-Sung goes back to his family's home, but his family is not there. He has a physical struggle with a man that is living in the house and he is eventually taken to the police station. There, he meets his friend Ho-Bang (Lee Si-Un) who is now a police officer. Meanwhile, Jung-Won is now 31-years-old and in debt. She still hasn't gotten over Hae-Sung's death. Jung-Won supports herself by working as a kitchen assistant at a restaurant. Min-Joon (Ahn Jae-Hyeon) is the chef and owner of the restaurant. He has feelings for Jung-Won and tells her so, but she rebuffs him due to Hae-Sung. One night, Jung-Won finds a young man passed out in front of her house. The young man is Hae-Sung.